32 Gloucester is located on the west side of Gloucester, between Commonwealth and Newbury, with 30 Gloucester to the north and 34 Gloucester to the south. 32 Gloucester was built in 1880-1881 by Frank Jones, mason, and E. C. Landers, carpenter, for building contractor William Seavey Rand, one of four contiguous houses (30-32-34-36 Gloucester) designed as a symmetrical composition and built for the Boylston National Bank of Boston, owner of the land, for speculative sale. William Rand is shown as the owner on the original permit applications, dated May 26, 1880. No architect is indicated on the applications. Click here for an index to the deeds for 32 Gloucester. On September 5, 1881, 32 Gloucester was purchased from the bank by Dr. Frederick William Payne. He and his wife, Gertrude (Dunlap) Payne, made it their home. They previously had lived at 677 Tremont. Frederick Payne was a physician with offices at the Hotel Pelham, at the southwest corner of Boylston and Tremont. The Paynes continued to live at 32 Gloucester during the 1889-1890 winter season. 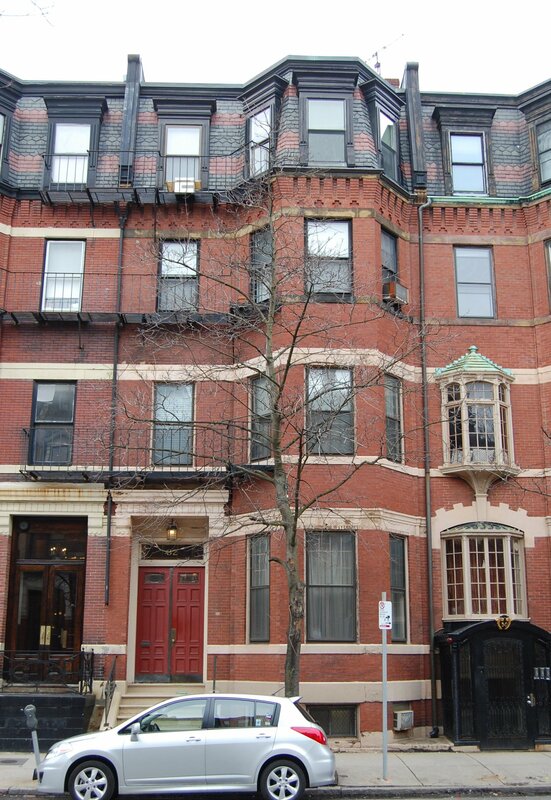 By the 1890-1891 season, they were living at the Hotel Austerfield at 7-9 Massachusetts Avenue. On May 15, 1889, 32 Gloucester was purchased from Frederick Payne by Miss Laura G. Sears. She and her sister, Madeleine Sears, made it their home. In October of 1907, Laura Sears married George Gardner Hall, a widower, who was owner of the Adams House Hotel. They moved to his home at 78 Beacon. 32 Gloucester was not listed in the 1908 Blue Book. On February 28, 1908, 32 Gloucester was purchased from Laura (Sears) Hall by real estate broker and trustee Paul Mascarene Hamlen. He and his wife, Agnes Dorothy (Devens) Hamlen, made it their home. They previously had lived at 845 Boylston. They also maintained a home in Wayland. The Hamlens’ two unmarried sons, Devens Hamlen and Nathaniel Hamlen, lived with them. Devens Hamlen, a merchandise broker, married in May of 1934 to Barbara Young and moved to 42 Gloucester; Nathaniel Hamlen, a real estate agent, continued to live with his parents. Agnes Hamlen died in January of 1936. Paul Hamlen remarried in May of 1936 to Dorothy (Draper) Gannett, the widow of Thomas Brattle Gannett, Jr., and daughter of former Governor Eben Sumner Draper. They subsequently maintained their home in Milton and Wayland. Nathaniel Hamlen continued to live at 32 Gloucester, joined by his brother, Devens, after his divorce in March of 1936. By 1938, they had leased the house to William B. Summers and C. Hunkins Webster, who operated their Boston School of Interior Decoration in the house. They remained there in 1939. Paul M. Hamlen died in July of 1939. In February of 1940, the estate of Paul Hamlen filed for (and subsequently received) permission to convert the property from a single-family dwelling into a lodging house. By April of 1940, at the time of the 1940 US Census, 32 Gloucester was the home of James Everett Preston, a shipwright, and his wife, Irene Elizabeth Preston, who operated it as a lodging house. They previously had lived at 526 Massachusetts Avenue. On September 11, 1941, the Boston Safe Deposit and Trust Company foreclosed on the mortgage given by Paul Hamlen and took possession of 32 Gloucester. On December 23, 1941, it sold the property to Irene Preston. The Prestons continued to live at 32 Gloucester, and operate a lodging house, until the early 1960s. The property changed hands and on July 27, 1966, was acquired by Anthony O. Gordon and Bernice G. Gordon, trustees of the AGO Realty Trust. Anthony Gordon had acquired 30 Gloucester in March of 1966, and in June of 1971, he transferred it to the AGO Realty Trust. On February 5, 1972, 30 Gloucester and 32 Gloucester were purchased from the AGO Realty Trust by Peter A. Dufour and Jose Leopoldo (Leo) Romero, Jr., trustees of the P & L Realty Trust. Leo Romero remodeled 30 Gloucester into a restaurant, Casa Romero, on the basement level, with a single-family dwelling on the upper floors, which became his home. 32 Gloucester remained a lodging house. 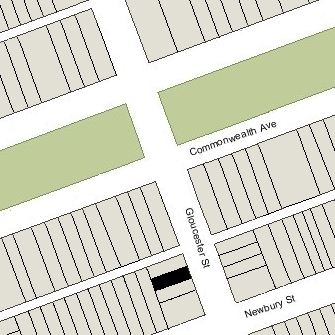 In July of 1974, the P & L Realty Trust applied for (and subsequently received) permission to combine 30 and 32 Gloucester into one property, construct a one-story rear addition 22.3 feet by 22 feet in size, and change the occupancy to be one restaurant and five apartments (with “the present street numbering to be retained”). Leo Romero subsequently extended his restaurant into the basement of 32 Gloucester. On April 7, 1980, 32 Gloucester was acquired from the P & L Realty Trust by G. Kinnear Pash and his wife, Deborah T. Pash. In February of 1981, the Pashes applied for (and subsequently received) permission to convert 32 Gloucester from a lodging house into four apartments and to allow the basement to continue to be used for restaurant dining and storage as an ancillary use to the restaurant (Casa Romero) at 30 Gloucester. On January 8, 1998, 32 Gloucester was purchased from the Pashes by Gary J. Kleeman and Mary T. Kleeman, trustees of the Kleeman 32 Gloucester Street Realty Trust. In November of 1998, the Kleemans applied for (and subsequently received) permission for the storage area of the basement to be used for additional dining space by Casa Romero at 30 Gloucester. 32 Gloucester remained a mixed residential and commercial building in 2017.